Rancho Mirage High School expects all students to work toward graduation and successfully transition to college or a career. All students are welcomed into a school culture that encourages individuality and expects extra/co-curricular participation in order to foster a sense of belonging. That is why we say: "OWN IT!" This academy will initiate students into the practical knowledge and hands-on skills of automotive maintenance and repair, as it produces graduates who will readily emerge into the automotive field, or choose to go on further training in the automotive industry. The facility features a full automotive garage and classroom. This academy includes a sequence of CTE courses combined with a rigorous course of study in the core academic areas. This well-known program is available for students who seek support to learn more about college and career options in order to best prepare for post-secondary education and beyond. This program focuses on WICOR strategies, study habits, time management, organization, and college exploration. Students are able to visit college campuses and explore careers based on various degrees. This newer pathway focuses on the variety of technical fields in the performing arts such as stagecraft, lighting, sound, costume design, set design, and business management. These lucrative jobs are in high demand in California, and RMHS is poised to prepare students to successfully enter this job market.Students are able to take a sequence of CTE courses combined with a rigorous course of study in the core academic areas. Separate from the Technical Theater Pathway sequence is the new Student Management Team course (SMT). Students are able to learn about the box office, business management, and marketing. Ticket sales, advertising, and ushering are some key components to running the Helene Galen Performing Arts Center (HGPAC) where students are able to gain practical, hands-on knowledge of managing a theater. These programs have been created to showcase the multiple disciplines of visual art, dance, theater, choir and instrumental music. RMHS will welcome students from across the district, that are interested in these art forms. The performing arts center features a 600-seat theater, rooms for scene and costume design, orchestra pit, black box theater, band and choir rooms. Students will have the opportunity to explore their area of interest, as well as participate in synchronized musical theater productions. These programs include a sequence of Visual and Performing Arts (VAPA) courses combined with a rigorous course of study in the core academic areas. 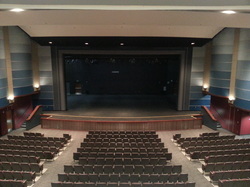 Rancho Mirage High School also houses the PSUSD Musical Theatre University (MTU) program for all aspiring entertainers.